A strong foundation in nutrition is essential for effective nursing practice. 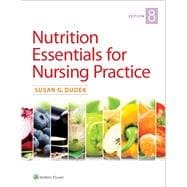 Reflecting the latest evidence-based practice and nutrition recommendations, this eighth edition of Susan Dudek’s highly respected text maintains its focus on all steps of the nursing care process, from assessment and nursing diagnoses to implementation and evaluation. • New! Unfolding case studies use real-life scenarios to build critical thinking skills by asking students to apply theory to nutrition issues. • A revised Chapter 1, Nutrition in Health and Healthcare, explains the role of nutrition in chronic disease prevention, the interdisciplinary nature of nutrition care, and how technology is affecting the future of nutrition. • Updated content includes the 2015-2020 Dietary Guidelines for Americans and its companion MyPlate, use of “eating patterns” in place of “diet” to connote lifestyle rather than a therapeutic approach, and inclusion of the newly revised Nutrition Facts label to be implemented for most packaged foods by 2018. • New topics include antibiotics in the food supply, new guidelines for the provision of enteral and parenteral nutrition support, and proposed changes in how malnutrition is defined. • An increased focus on obesity prevention and treatment includes lifestyle modification, medication, and bariatric surgery. • Built-in learning aids, include chapter-opening Check Your Knowledge questions, key terms defined in the margins, at-a-glance Nursing Process tables, chapter-ending Key Concepts summaries, and How Do You Respond? questions that prepare students to think on their feet in clinical practice.